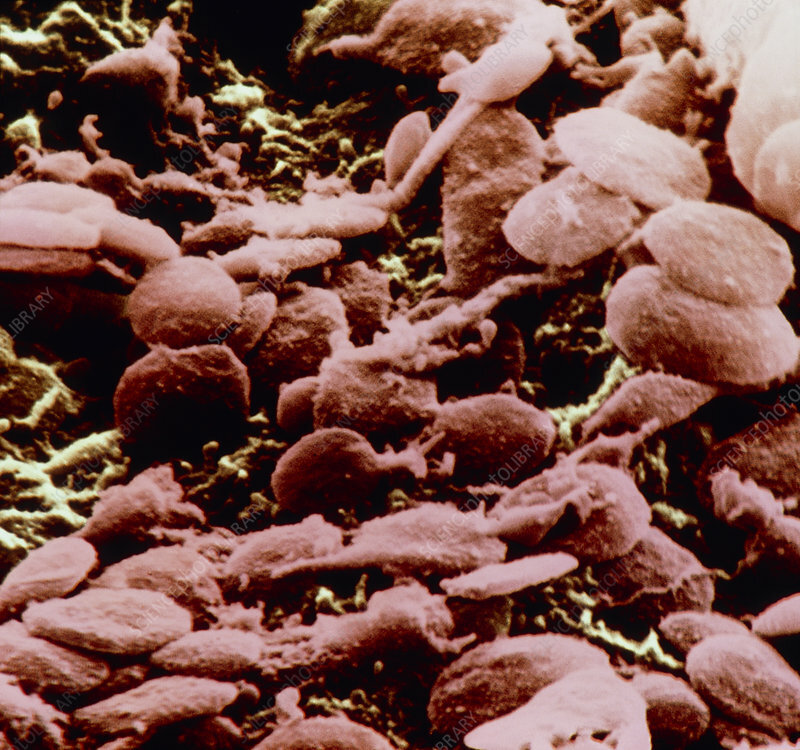 False-colour scanning electron micrograph (SEM) of unactivated blood platelets on the surface of endothelium. Platelets, or thrombocytes, are small, non-nucleated cells formed in the bone marrow. They occur in circulating blood in large numbers. In an unactivated state they are shaped like round or oval wafers 2-3 micrometres in diameter; activated platelets (see photo P256/013) have dendritic processes. Platelets function in 2 ways: they help plug small defects in the walls of small blood vessels; & they are involved in blood clotting & in the release of serotonin, which reduces blood flow by constricting damaged vessels. Magnification: x4800 at 6x4.5cm size.